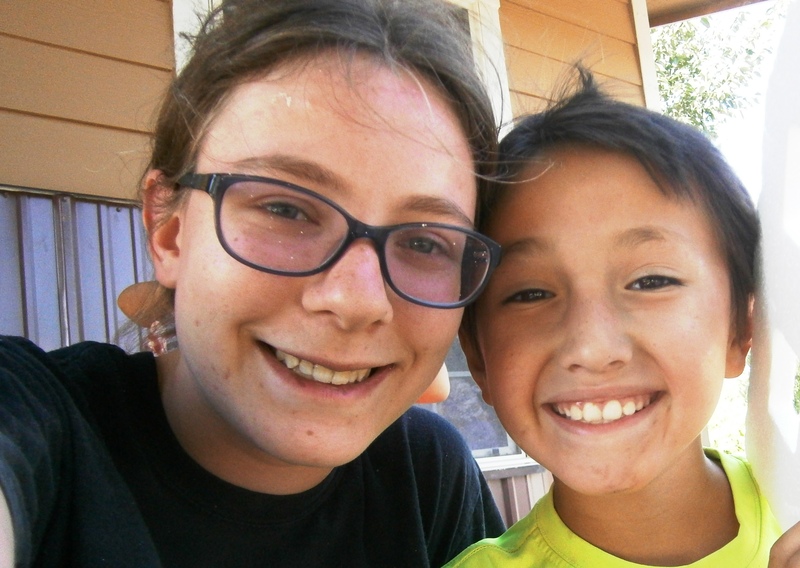 My daughter Stacey and I, along with about 20 other people from our church, spent a week at Pine Ridge Reservation in southwestern South Dakota for a mission trip. On Saturday, August 8, we headed home. We got up extra early that morning, grabbed a quick breakfast, and loaded the vehicles for the 1,100-mile drive back to Fairfield. As we were loading, one of the Next Step staff members told me that the left over materials had been delivered to the people I had met. Wilbert Sr. lives next to the home I had been working at all week, and his son Wilbert Jr. was staying with him for the summer. The home had been seriously damaged in a spring storm, and with the left over materials, the two Wilberts should have just about enough materials to make repairs before winter. Reportedly, the Next Step team woke up Wilbert Sr. as they were delivering the materials. Before they had even finished unloading, Wilbert was out in the yard, in his pajamas, with a claw hammer, yanking the remains of the old siding from the damaged side of his house. The trip home was mostly uneventful. We traveled US-18 eastward across the southern edge of South Dakota, caught I-29 south to I-80 east. After spending the night in Peoria, we took I-74 home. I grabbed a handful of geocaches at rest stops and gas stations along the way. We arrived back at Fairfield on Sunday afternoon. I put a total of just over 3,000 miles on my car over the 10-day trip. Probably the strangest thing that happened on the entire trip involved the dog we picked up on Friday. We were stuck at a construction zone on a dirt road in the absolute middle of nowhere when a dog appeared by our cars. Assuming the dog had been abandoned, we took it to the animal shelter in Pine Ridge. Assuming the dog would never be claimed, and eventually euthanized, one of the women from our group went back to the shelter, adopted the dog, and took it back to Fairfield with us. As luck would have it, this particular dog, unlike the vast majority of Rez dogs, actually did belong to someone. And, the person who owned the dog happened to be a high-ranking tribal leader, who, apparently, lives in the absolute middle of nowhere, and wanted their dog back. So, the dog had to be packed up and shipped back to Pine Ridge. Of all the hundreds of dogs in Pine Ridge, we had to pick up the wrong one! A lot has happened since the trip. I’m back to my normal routine, and have been very busy, as evidenced by the fact that it’s taken me six weeks to finish this series of blogs. I took Stacey back to Virginia for her second year at Liberty University, and took a side trip to Georgia to find some very old geocaches. I’ve been thinking a lot about Pine Ridge, trying to find ways to continue helping the residents. I’ve been in email contact with Denver American Horse, Veterans Service Officer for Oglala Lakota County, who runs the shelter for homeless veterans, and with Leon Matthews, who owns the Higher Ground coffee shop and writes a column for the Lakota Country Times. 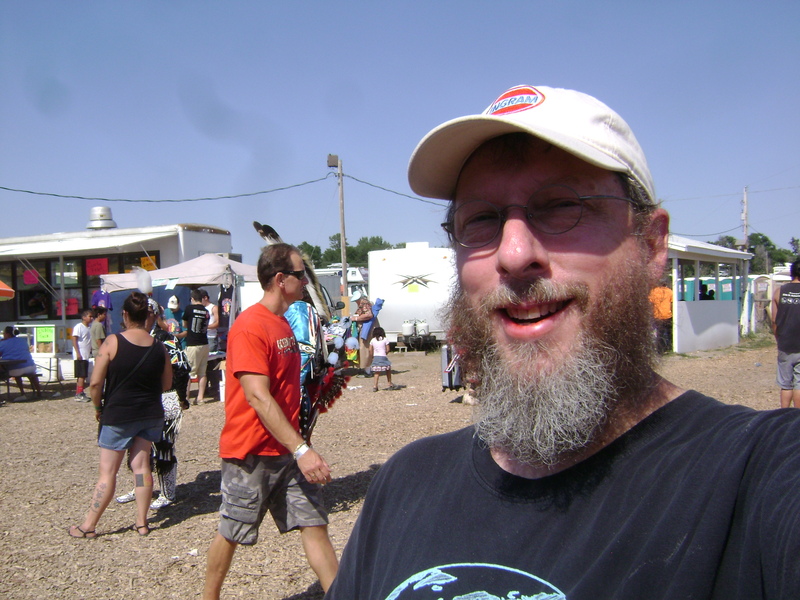 I’ve already signed up for next year’s trip to Pine Ridge with our church, along with Stacey and my wife, Ellen. This will be Ellen’s first trip to Pine Ridge, and I’m hoping she’ll be as drawn to work with the Lakota as I have become. Our church is raising funds to rebuild the trailer purchased by Aimee, the young single mother of three children living in her car. We’re working through some local Pine Ridge folks to try to get the trailer inhabitable before winter hits. As a back-up plan, John and Nadine have offered to let the family stay with them. Bruce and Marsha from Lakota Hope will be visiting Fairfield next month, to share with our church their hearts for the Lakota people, and their vision for ministry in the area. We’re also trying to get John Two Bulls out for a visit, to share what his ministry is all about. Mission work isn’t just about going someplace, doing a project, and telling people about Jesus; it’s also about building long-term relationships with people. For those followers of Jesus at home, we need to support those in the field, not just with an occasional online donation, but by building relationships, and with prayer. Whether we are middle-class suburbanites from southwest Ohio, or native Lakota on the reservation, or missionaries who have moved somewhere to work full-time in missions, or anyone else, as followers of Jesus, we are all in the same family. We are all part of the body of Christ. And, we all need to work together, with our different talents, resources, and gifts, to share the Gospel with those who aren’t yet in the family. Please pray for Pine Ridge. Pray for the economic situation to improve, for the continuing suicide epidemic to end, for an end to the gang activity, and for their health and safety getting through the winter. Most of all, pray for hearts to be opened, and for many to come to know Jesus Christ as Lord and Savior. Pray for the spiritual protection for the Christians on the Rez. 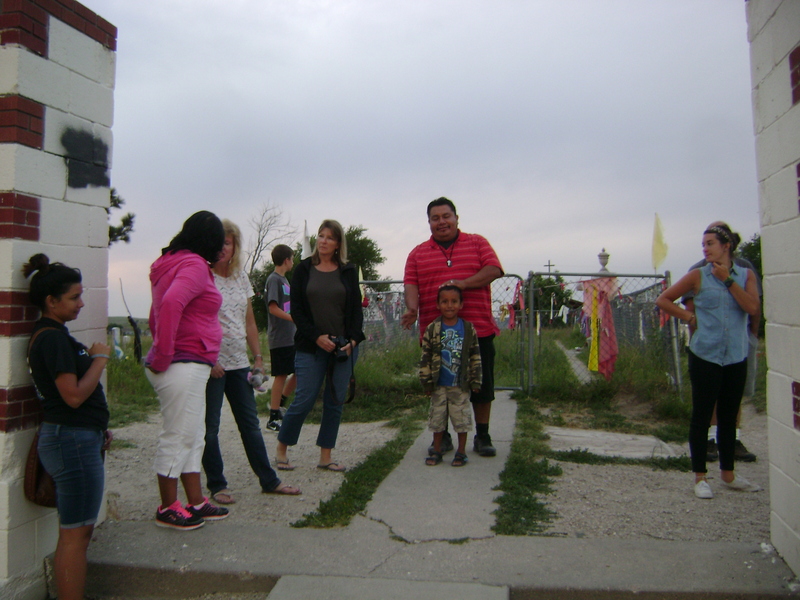 And pray for those who are working to bring revival to the Pine Ridge Reservation. *** If anyone would like to help financially with the work that’s being done at Pine Ridge, you can either contact me, or send a check to Fairfield First Baptist Church, 1072 Hicks Blvd. Fairfield, OH 45014, and indicate that the money is for the Pine Ridge Fund. Friday was the last full day we spent at Pine Ridge. It was our “free day” – no construction work was scheduled. Most groups went to Badlands National Park, Mount Rushmore, or the Black Hills. We spent most of the day meeting with people and building relationships. Our first stop was at the home of a Lakota woman named Ruby. Ruby lives in a trailer on the outskirts of the town of Pine Ridge, near the airport. 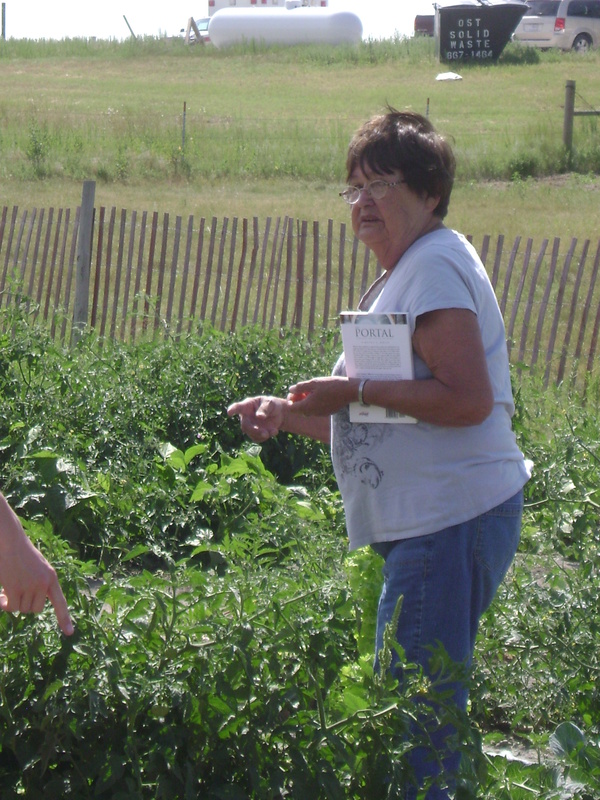 She works to bring the message of the Gospel to the people of Pine Ridge in a number of ways. Ruby has a large garden where she grows a variety of vegetables, and she gives most of the produce away. One of the things I had noticed yesterday when I had visited the only grocery store in town was that the price of produce was extremely high. The government commodity foods that most of the residents receive contain very little fresh produce, and since most residents have extremely limited income, it must be very difficult for many residents to obtain fresh produce. Ruby’s garden helps with this. Ruby also brings in a local Gospel band to do concerts, sometimes under a tent in her yard. She said that most Lakota won’t come to hear a speaker, but will come to hear music, and the message of Jesus Christ can be spread through music. Ruby’s main income is her Social Security check, which she spends mostly to help others. She said, “I’m very poor materialistically, but very rich in God’s blessings.” Such a wonderful attitude! Some of the guys grabbed lawnmowers and mowed Ruby’s yard. 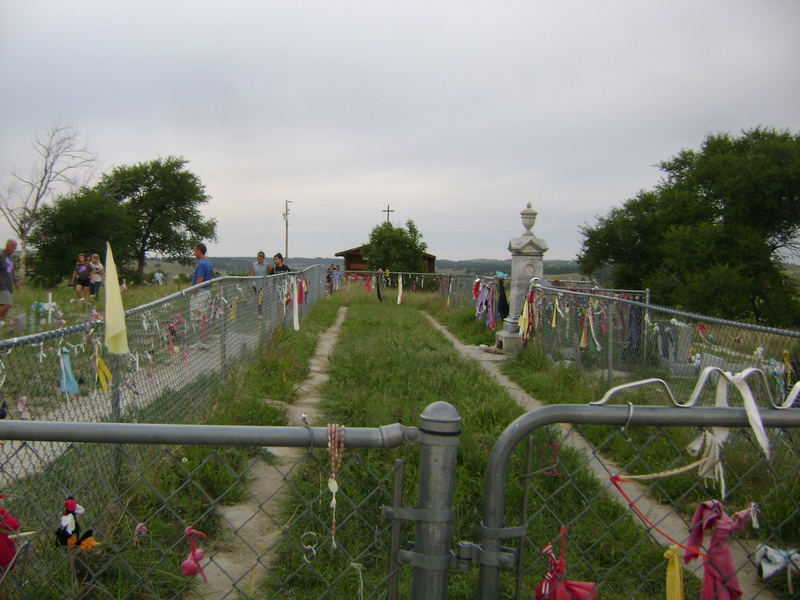 Our next stop was at the Our Lady of Lourdes Catholic Cemetery in Porcupine, SD, to visit the grave of Cody White Pipe. Many from our group met Cody, a 21-year-old Lakota man, a year ago while on another mission trip to Pine Ridge. Cody was hitch hiking, and they gave him a ride. Some of the group spent time getting to know him, and they became friends. About a month later, after the Fairfield group had returned home, Cody was killed in a hit-and-run accident. He had been visiting his sister, and had decided to walk home. His body was found on the side of U.S. Highway 18 about five miles east of Vetal, according to the Rapid City Journal. Cody’s obituary is here. Jessica, our group leader, went to Cody’s wake, and befriended several family members. We were met at Cody’s grave site by his sister. She told us that Cody’s case is still considered open by the police, and that he might have been a victim of homicide. Apparently, there were indications at the scene that his death might not have been an accident. 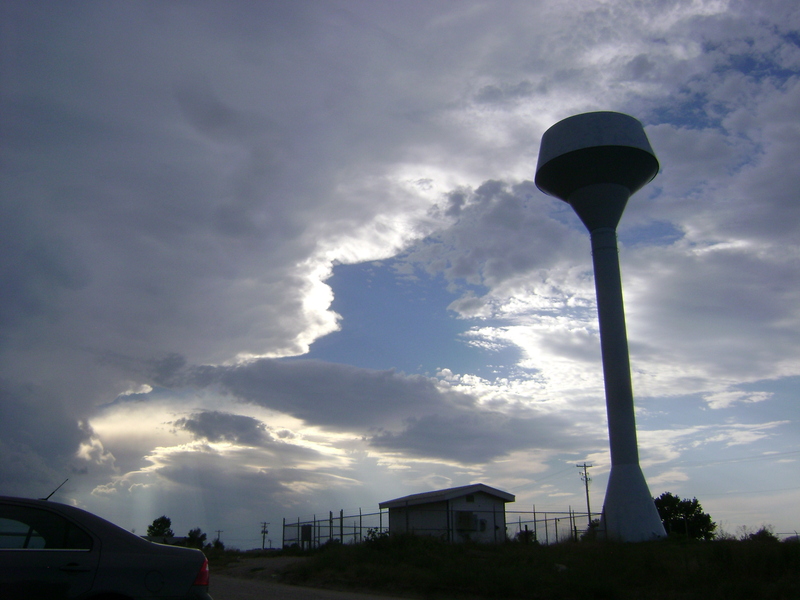 For many years, Pine Ridge Reservation has had a homicide rate much higher than the national average, and many of the murders remain unsolved. Gang violence is responsible for many of the murders. Although Cody was not affiliated with any of the gangs on the reservation, Cody’s family suspects that he might have seen something, or said something, or been mistaken for someone else, and paid for it with his life. According to his sister, Cody had mentioned seeing a mysterious, dark figure a week or so before his death. Many Lakota believe in a “Tall Man” spirit, a spirit of death, which often appears to people before they die. Because Lakota religion is based around spirit worship, demonic activity is rampant on the reservation. It’s quite possible Cody’s death was influenced by this demonic activity. Something that struck me as I walked around the cemetery was the large number of young people and children buried there. There are many graves of infants, children, teenagers, and young adults in their 20s, far more than in most cemeteries I’ve visited. 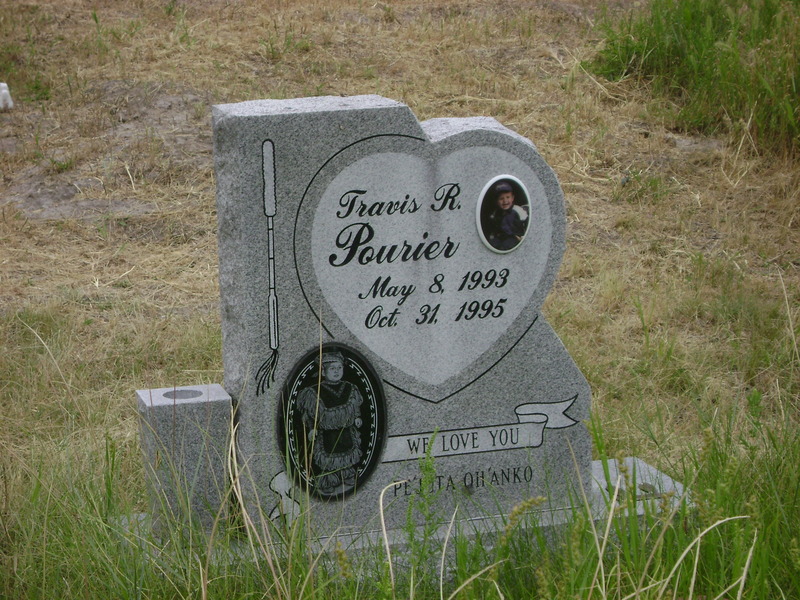 I’ve seen graves of children in pioneer cemeteries from the 1700s and 1800s, before modern medicine had been developed. These graves, however, were mostly from within the last 50 years. It really hit home to me how the medical care and relative safety I take for granted are simply not available to many on Pine Ridge Reservation, with deadly consequences. 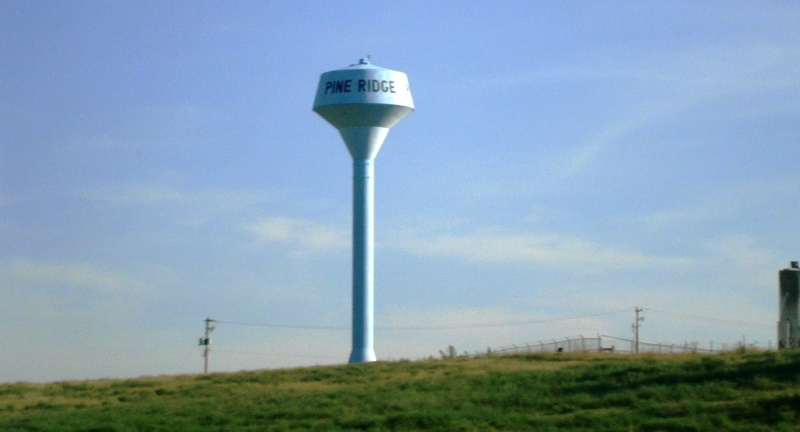 Pine Ridge has the lowest average life expectancy in the United States, largely because of childhood deaths. The problems with poverty on Pine Ridge and many other reservations have little to do with the current welfare system, but stem from treaties signed in the 1800s that have never been fully honored and never been renegotiated or revised. This has led to conditions comparable to third-world countries like Haiti, in the heartland of the United States. As we were getting ready to leave the cemetery, Cody’s mother and other sister arrived. This other sister is the young lady we had met at Big Bat’s earlier in the week; she is currently homeless, living in a car with her three children. She recently bought a trailer, not far from the cemetery, for $400. We drove over to take a look at it. The trailer had recently been used as a meth lab – there was drug paraphernalia and lab equipment strewn around. The interior had been completely stripped, the windows were all broken, and the drywall and insulation were gone. There was mold, dry rot, no plumbing, and no electric. The trailer was completely uninhabitable, even by Pine Ridge standards. My daughter Stacey and I, along with at least one other person from our group, sensed something strange in and around the trailer. I went into the trailer, and was looking around, when I felt very strongly like I was being watched, like someone or something was hiding nearby. It freaked me out – I had to get out of the trailer immediately. Stacey said she sensed an evil “presence.” Neither Stacey nor I saw anything, but we sensed it. I’ve had this sort of sensation a few times before. In college, I used to get the same feeling every time a certain girl was around – even when I didn’t know she was there. It turned out, she was very heavily into the occult and witchcraft. Stacey and I both believe that there was some sort of demon in or near the trailer. Most of the people in our group said they didn’t see or sense anything unusual, but I’m sure there was something there. I realize some of my readers think demons are nonsense; however, as a follower of Jesus Christ, I believe demons are real. I don’t fear them, because the Holy Spirit dwells in me and protects me. However, they’re not something to be messed with, and for non-Christians, they can be extremely dangerous. The general consensus among the adults in our group was that the trailer either needed to be completely dismantled and replaced, or that it would need a complete overhaul before it would be inhabitable. We were uncertain what, if anything, we could do to help get it to a livable condition before winter. Our next stop of the day did involve a little sightseeing. We drove to a roadside pull-off overlooking the Badlands on BIA-41 between the town of Oglala and Red Shirt. We had been given a “short cut” from Porcupine that wouldn’t involve going back through the town of Pine Ridge. The “short cut” turned out to be a 21-mile long dirt road through the middle of nowhere. While we were driving down this road, in the middle of absolutely nowhere, a woman holding a STOP sign stood in the middle of the road. It turned out, there was a road crew grading the road. We had to wait for 45 minutes for the road to be cleared enough for us to pass. While we were sitting at a STOP sign, on a road in the middle of nowhere, a dog appeared. Most Rez dogs live in town, and are uncared for. This dog was in the middle of nowhere, and it seemed like it might have been cared for a little bit fairly recently. Since we were in the middle of nowhere, with no sign of a house or farm, just a lady holding a STOP sign, we assumed the dog had been abandoned by someone, and the dog was picked up to be taken to the animal shelter in Pine Ridge. When we finally got to the overlook, the view was spectacular. The Badlands is an area composed of extremely soft sedimentary layers which have been eroded, leaving spectacular canyons, ravines, gullies, buttes, and mesas. The Badlands are a bit of a problem for the idea that the earth is billions of years old. The landforms and geology fit much better with the Biblical young-earth timeframe. The layers would have been rapidly deposited during the Great Flood, and quickly eroded immediately after, leaving the sharp landforms. If the process had taken millions of years, the landforms would be far flatter, lacking the sharp vertical structures, due to the extremely soft sediments. camp. The 7th Cavalry was the same unit that had been obliterated under General Custer at the Battle of Little Big Horn. The next morning, while attempting to disarm the Lakota, a shot was accidentally fired; the soldiers opened fire indiscriminately from all sides, killing men, women, and children, as well as some of their own fellow soldiers. The surviving Lakota fled, but U.S. cavalrymen pursued and killed between 200 and 300 Lakota, and wounded at least 51, most of whom were unarmed women, children, and elderly. Following a three-day blizzard, the military hired civilians to gather the frozen bodies and heap them in a mass grave on the hillside overlooking the massacre site. This event essentially ended all resistance to the Reservation system, and put into motion events that have led to the deplorable conditions that exist on the reservation to this day. The second incident, 83 years after the massacre, began on February 27, 1973, when approximately 200 Oglala Lakota and followers of the American Indian Movement (AIM) seized and occupied the town of Wounded Knee, just a few yards south of the massacre site. The occupation was part of an internal political struggle within the Lakota tribe, but was also a protest against the United States government’s failure to fulfill treaties with Native people and demanded the reopening of treaty negotiations. 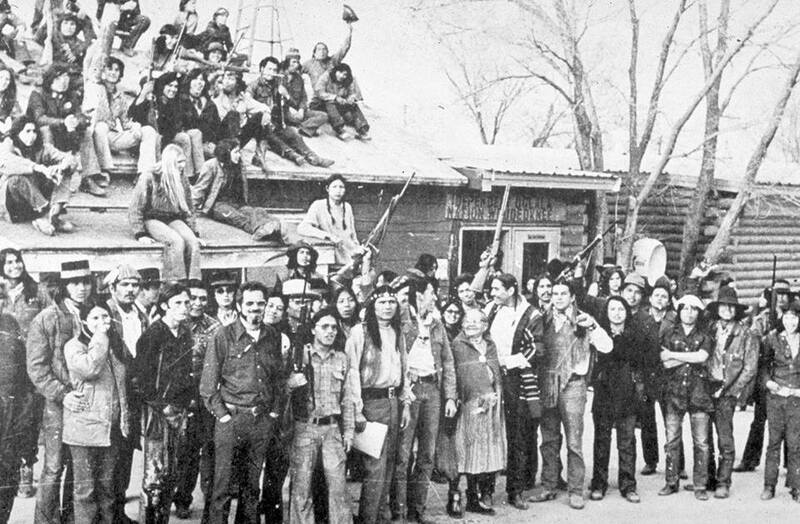 Oglala and AIM activists controlled the town for 71 days while the United States Marshals Service, FBI agents, and other law enforcement agencies cordoned off the area. The internal tribal political conflict continues to this day, with traditionalists pitted against progressives for control of the tribe. John and Nadine Bissonette joined our group at the cemetery to share their personal stories. I didn’t write down all the details, but one of Nadine’s great grandparents was present at the Massacre of Wounded Knee. I don’t remember whether she said her ancestor was a survivor, or whether they died during the massacre. John’s family was very involved with the 1973 incident. His uncle Pedro Bissonette was the director of the Oglala Sioux Civil Rights Organization (OSCRO), who, along with AIM, occupied the town of Wounded Knee. In the aftermath of the incident, more than 60 opponents of the tribal government died violently, including John’s uncle Pedro Bissonette, his aunt Gladys Bissonette, and his mother Jeanette Bissonette. John was a toddler when his mother was murdered in her car by a sniper, with John in the back seat. Her murder remains unsolved. The visit to the Wounded Knee Memorial was a very somber event for me. 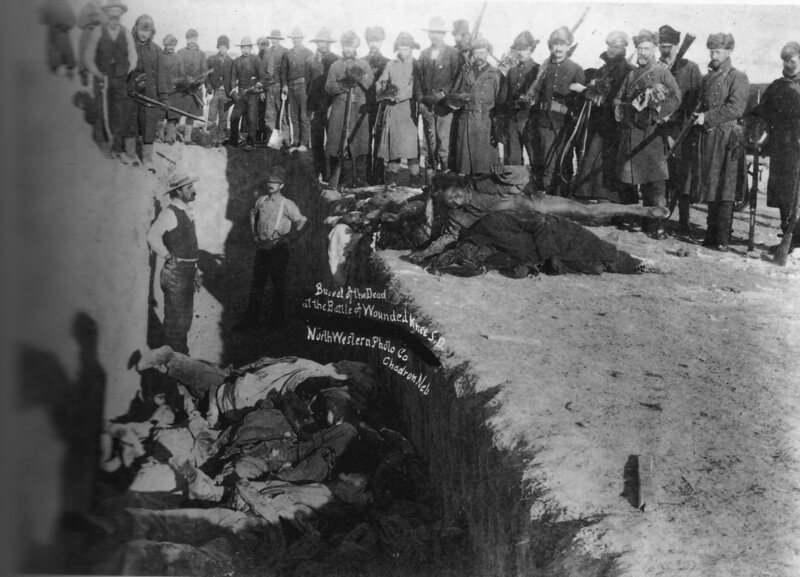 The massacre was a pivotal point in the long history of oppression the Lakota have suffered. The aftershocks of Wounded Knee are still felt on the Rez. It reminded me of why I went to Pine Ridge: the people of Pine Ridge have suffered for many years, and desperately need the hope that only Jesus Christ can provide. That evening, one of Cody White Pipe’s sisters stopped by the Next Step compound to say goodbye to our group. I wasn’t involved, but some of our group talked with her late into the night and shared the Gospel. As I spent my last night in my cot at the Next Step compound, I prayed that the work we had done and the relationships we had built had brought hope to someone, and that somehow my visit to Pine Ridge would be used by God to bring someone closer to knowing Jesus Christ as Savior. 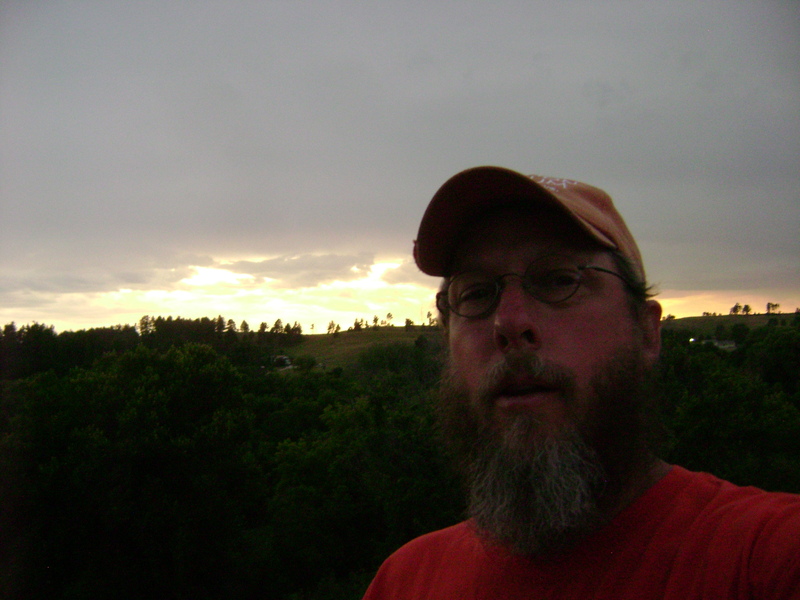 Our fourth full day at Pine Ridge Indian Reservation began with me not feeling very well. Our room had been rather warm that night, and I got very little sleep. I’m sure the fact that I had taken in huge amounts of caffeine the day before didn’t help, either. In any case, I had a headache, and was one of the last people to get up. I had to rush to get breakfast, pack my lunch, and get on the road. On the way to Higher Ground for coffee, I stopped at the only grocery store in Pine Ridge, Sioux Nation Shopping Center, to buy a dozen oranges, a dozen bananas, and a box of peanut butter chocolate chip granola bars for Tyson and Tyrell, the two boys we had met living next door to our work site. The teens in our group mentioned that they had said they liked bananas, oranges, and peanut butter chocolate chip granola bars, so I figured getting them some would be a great way for our kids to get to share Christ’s love with them tangibly. While I was at Sioux Nation, the van carrying most of the rest of our group stopped for a hitchhiker. 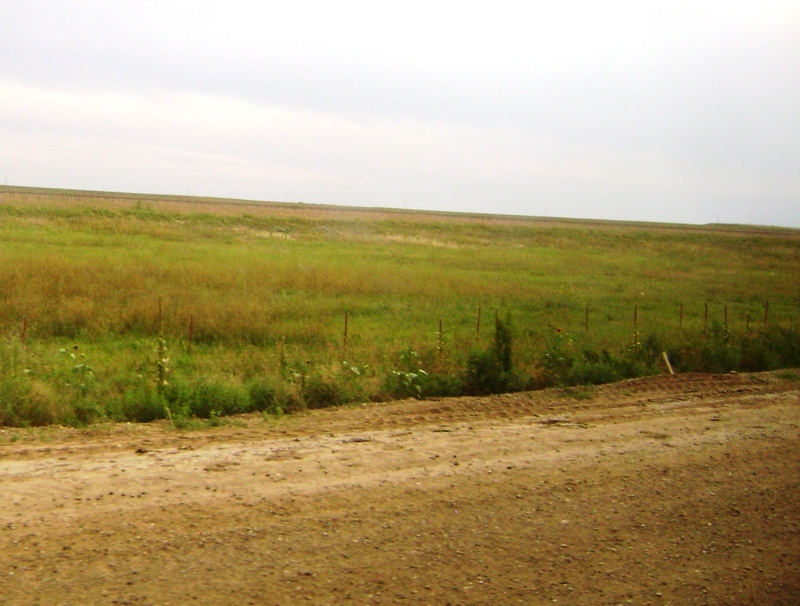 Hitchhiking is very common on the Rez; many people don’t have cars, and there is no public transportation. Brian, our youth pastor, who was driving the van, had been very hesitant about picking up hitchhikers, but God prompted him to stop. The man was walking away from a disabled car, parked on the side of the road, and was headed toward Pine Ridge, about 12-15 miles away. He was quite grateful for the ride. Brian told him we weren’t going all the way into Pine Ridge, but that we’d be stopping near the edge of town. The man said that was fine, since he wasn’t going all the way into town, either. It turned out that the man was Tyrell and Tyson’s uncle, and that he was headed to their house – next door to our work site. I don’t believe this was a coincidence! 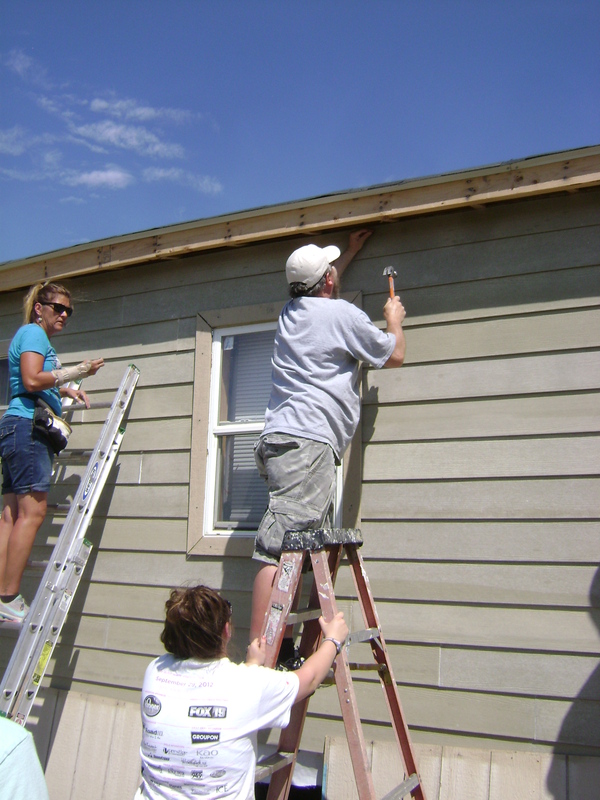 Again, the crew from South Carolina worked with us as we continued with soffet, trim and painting. As the day progressed, I started feeling a bit dizzy and extremely tired. I had to stop and rest in the shade frequently, much more so than on any of the previous days. I didn’t figure out until later that, in addition to not getting much sleep, in the rush to get moving that morning, I had inadvertently forgotten to take my medications. No sleep + no meds + heat = bleeeaaah. Candy (the home owner) and her husband are extremely fortunate, in that both have jobs. We didn’t see them much during the week, but during her lunch break, Candy stopped by to say thank you in person. She was extremely grateful for the work we had been doing, and thrilled for the progress we had made on her home. We thanked her for the privilege of working on her home. On our lunch break, some of the teens went next door to deliver the fruit and granola bars, and to play basketball with Tyson and Tyrell. The boys, as well as the woman who answered the door, were very appreciative for the food. Lunch sort of revived me a bit, and I saw Wilbert Sr. (whom I had not yet met) in his yard, so I went over to the fence to introduce myself. We talked about the storm that had demolished the end of his house, and about how we were hoping to be able to donate the leftover supplies to him, so that he could get the house repaired by winter. I went over and measured the damaged section of his trailer in order to get an idea whether there would be enough leftover supplies, or not. Later that afternoon, the guy from Next Step in charge of materials gave the tentative approval for the donation; he would still be within budget without returning the leftover materials to the store, and didn’t think final approval from Next Step headquarters would be an issue. His biggest concern was that the materials would just sit there and not be used; he didn’t want limited resources going to waste. I assured him that, based on my conversations with Wilberts Jr. and Sr., the work would get done quickly. At the end of our workday, there was still quite a bit of work left to do on Candy’s home. Since this was the last day for us to be on the work site, and the last week for the summer for Next Step to work, it meant that the Next Step staff would need to finish the work over the next 2 days. Fortunately, the bulk of the work was done, mostly leaving painting and finishing touches. That evening, we were invited for dinner and to the dedication of the home the other group from Fairfield First Baptist had been working on. This was the first from-the-ground-up project Next Step had undertaken at Pine Ridge. During the dedication, we had the opportunity to meet and hear John Two Bulls speak. John is a native Lakota, a pastor, and an evangelist, who works in suicide prevention and helps people get out of gangs. Suicide is a serious problem on the Rez. The overall suicide rate is more than twice the national average, and the teen suicide rate is more than four times the national average. One of the most disturbing things about many of the suicides is that they appear to be instigated by demonic activity. Many of the suicide notes and survivors tell of a shadowy, dark figure, sometimes called the Tall Man spirit, who tells them to kill themselves. Many Lakota traditionally believe in a “suicide spirit” similar to the Tall Man spirit. Since traditional Lakota religion is based on spirit worship, it should be no surprise to Christians that demonic activity would be rampant on the Rez. There are few mental health professionals on the reservation; not nearly enough to handle the depression and despair that comes with poverty and high rates of alchohol and drug abuse. John told the story of 12 teens who had a suicide pact; they were going to all hang themselves at the same time. John was tipped off, and rushed to the scene. There were 12 nooses hanging from trees, and a crowd of teens gathered. Some were going to hang themselves; others came to watch. By the grace of God, John arrived in time to stop the hangings. He was able to counsel with many of the teens, and some received Jesus Christ as Savior. The incident was so significant, it was even reported by the New York Times. The evidence of demonic influence on the Rez was also illustrated by a startling statistic John mentioned: There are more violent deaths on the Rez during the month when most of the Sun Dances occur than in the rest of the year combined. The Sun Dance is a Lakota religious ceremony that usually lasts several days. The purpose of the Sun Dance is to offer personal sacrifice as a prayer to the spirits for the family and tribe. It usually involved ceremonial cleansing through fasting and the sweat lodge, and often involves a ritualistic piercing, where men dance around a pole to which they are fastened by rawhide thongs pegged through the skin of their chests, until the wooden pegs rip out. Participants also seek visions from the spirits. Most Christians would recognize these “spirits” as demonic. It’s not surprising that ceremonies involving praying and sacrifice to demons would result in a drastic increase in violent deaths. The statistic John mentioned bears this out. 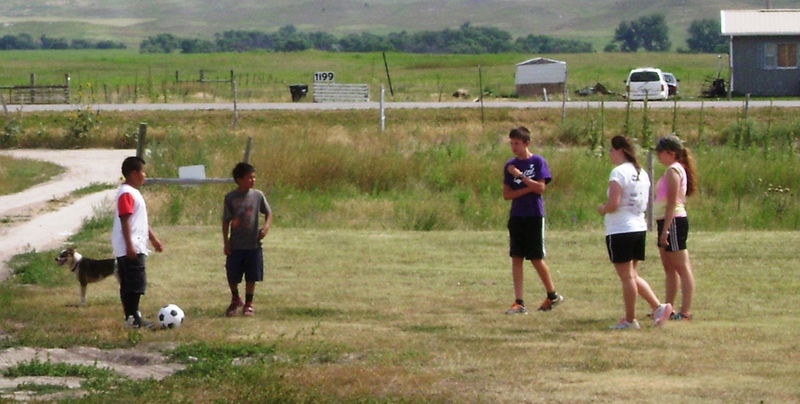 Gang activity is rampant on Pine Ridge Reservation. There are at least 40 different gangs on the reservation, with anywhere from a couple dozen to a couple hundred members. 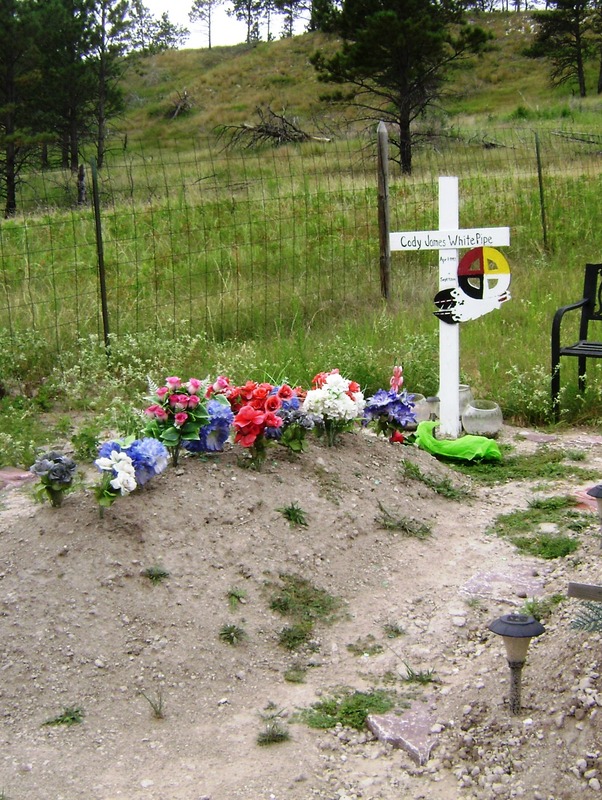 Most of the murders on the reservation are tied to gangs, along with much of the other crime. John Two Bulls works with gang members to get them out of the gangs, and shares the Gospel with them. Many have come to faith in Jesus Christ as a result. Later that evening, back at the Next Step complex, we had a worship service, followed by a visit from Jerry Bear Shield. Jerry is a Pine Ridge native who lost his sight after being beaten up by a gang. 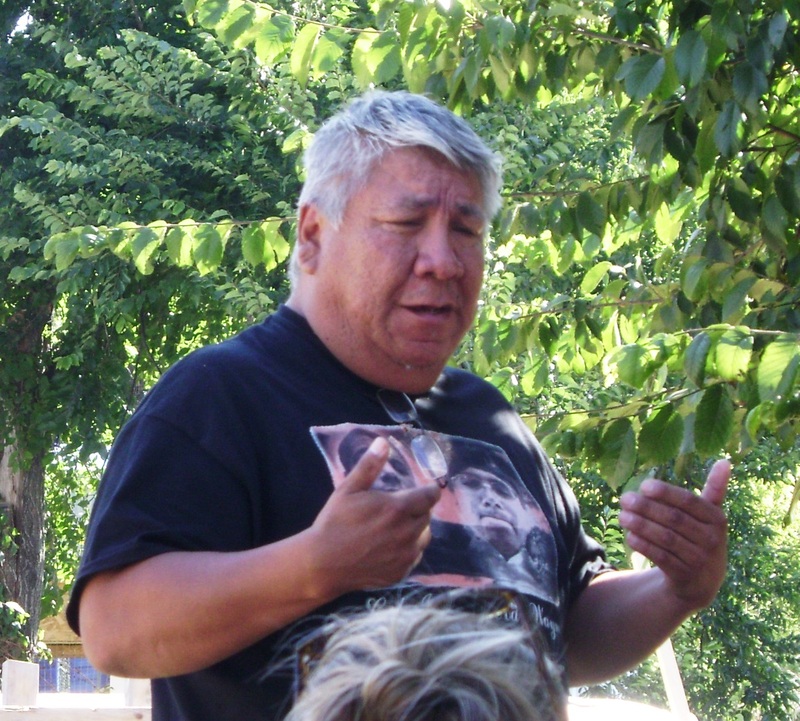 He’s a soft-spoken man who told some great stories about life on the Rez. That night, it was cooler, and I got some much needed rest. And, I remembered to take my meds! 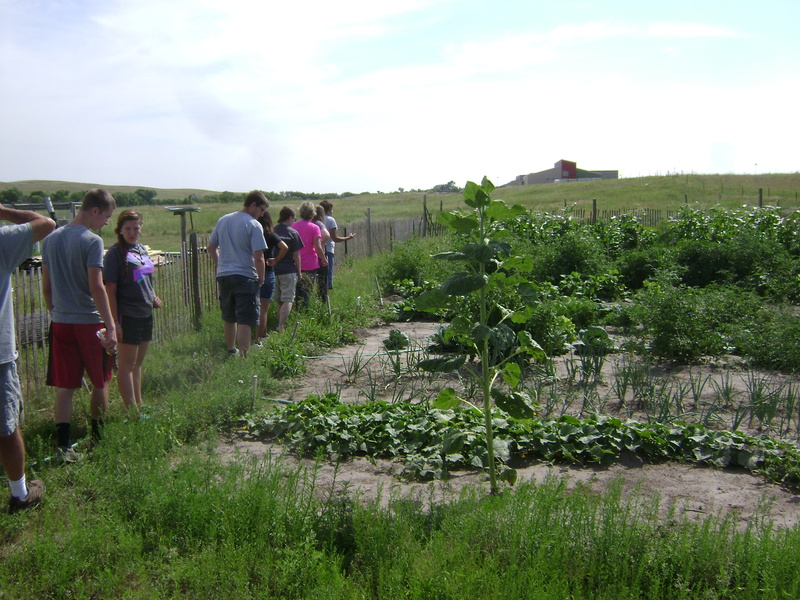 Wednesday, August 5 marked the midpoint of our stay at Pine Ridge Indian Reservation. We woke up to the water being out for most of the complex where we were staying. Fortunately, we had water in the building where I slept. Breakfast was a little slim, since the water was out in the kitchen, and it was the last week of trips for the summer. I had a couple of bagels, although one of them had a little mold on it. I started to complain, but then thought about how what I had for breakfast was more than a lot of the people who lived on the Rez had to eat that morning. So, I pulled the moldy spot off, and ate the rest. On the way to the work site, we once again stopped at Higher Ground for coffee and muffins. On the work site at Candy’s house, we were rather behind schedule for being able to complete the work by week’s end. Fortunately, one of the crews from South Carolina had completed their project on Tuesday, and and were able to join us. The SC group started tackling the end of the trailer with all the rotting framing. 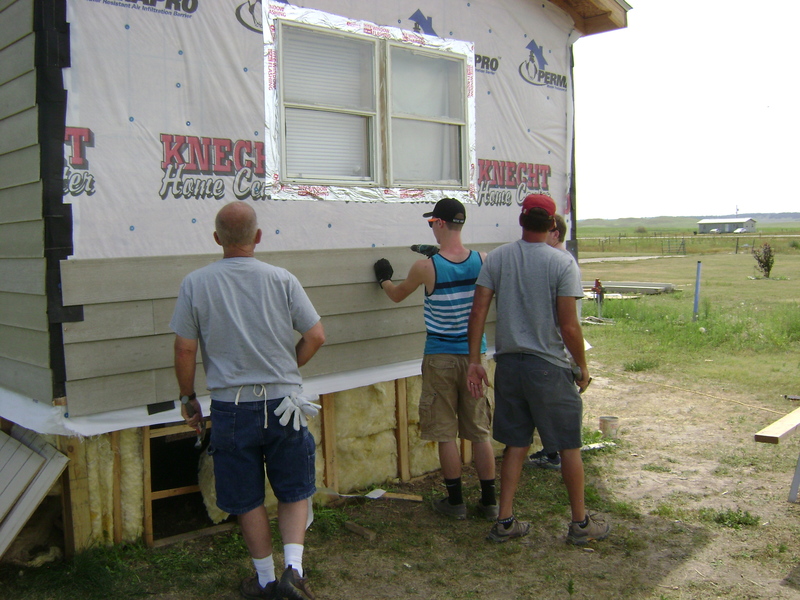 The Fairfield group continued with siding, soffet, trim around the windows and doors, and painting. Fortunately, Next Step was able to get more ladders and a small scaffold to the site – the lack of ladders had been the biggest factor slowing us down. The work began progressing more quickly! Unlike yesterday, when there had been clouds and a strong breeze, today was very hot and windless. Unfortunately, most of the remaining work was on the sunny sides of the house, and there is little shade in the yard. I chugged through a large coffee, 2 Monsters, 2 bottles of water, two Gaterades, and was still thirsty. One of the things Next Step requested was that each group bring tools from home, to supplement the tools they provided. We had been given a list of requested tools to bring. I brought my cordless drill and circular saw, which were on the list. I also grabbed several tools that weren’t on the list, following the Boy Scout motto, “Be Prepared.” Among those were a jigsaw, extra drill bits, extra saw blades, and extra work gloves. Today, we used all of these. During a break, I walked over to talk with Wilbert Jr. again. I told him that the guy from Next Step in charge of materials said we might be able to leave extra materials, but he had to check to see if he was still within budget, and get approval. Hopeful, but no promises. 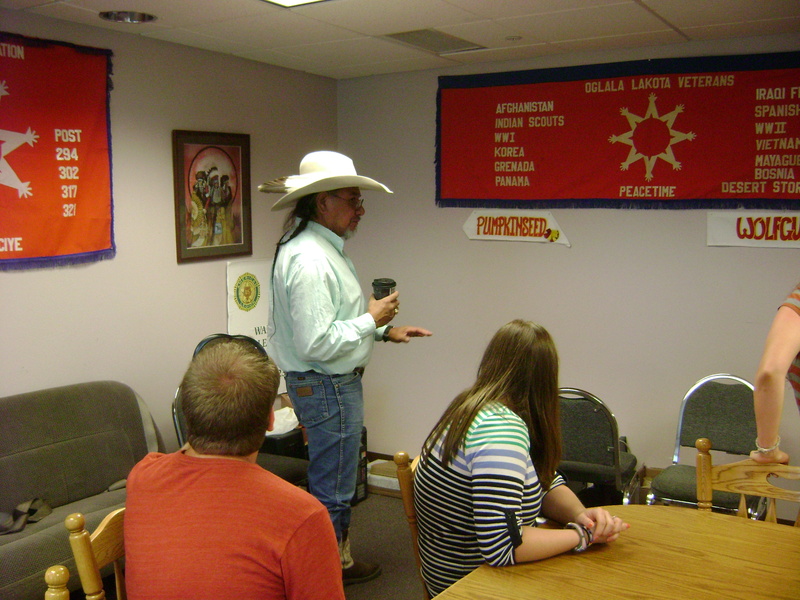 That evening, our group brought Subway sandwiches to Lakota veterans living in a veterans home in Pine Ridge. We had a chance to sit down with Denver American Horse, Veterans Service Officer for Oglala Lakota County, who runs the shelter. Denver is a fascinating man, whom I would love to sit down with one-on-one and simply listen. One of the things I’ve heard is that many Lakota resent outsiders doing work on the reservation, especially churches. I asked Denver whether he thought groups like ours, coming from outside the reservation to do various projects on mission trips, were actually doing any good on the reservation. He said, yes, what we were doing definitely helped. I then asked him what else we could do, besides these sorts of short-term projects. He explained that a lack economic development is the biggest problem faced by people on the reservation. There simply are very few jobs, few stores and businesses, and few opportunities to bring jobs and businesses to Pine Ridge. The biggest help outsiders could provide is to bring jobs to the area. He mentioned that under Bush’s Faith Based Initiative, religious groups should be able to get government grants that could be used to bring services and jobs to Pine Ridge, but that no group that he was aware of had ever tried. Someone also asked Denver about the significance of eagles in Lakota culture. He said that the eagle takes the prayers of the Lakota to the Great Spirit. I thought that was interesting. 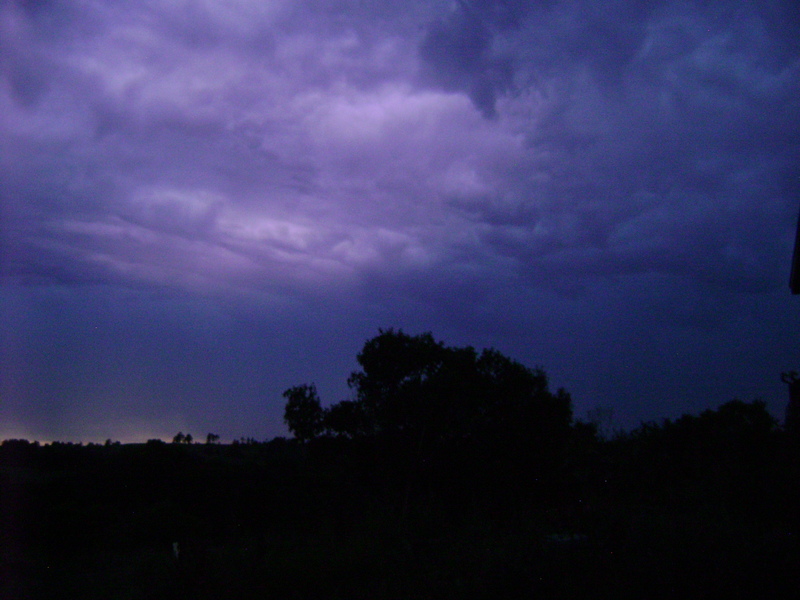 That evening, after returning to the Next Step complex, we were treated to a thunderstorm. Thunderstorms on the Great Plains are awesome to watch, as long as you have a safe spot to watch from. God gave us an amazing light show! After our worship time, I showered, and went to sleep. Tuesday, August 4 was our second full day at Pine Ridge. 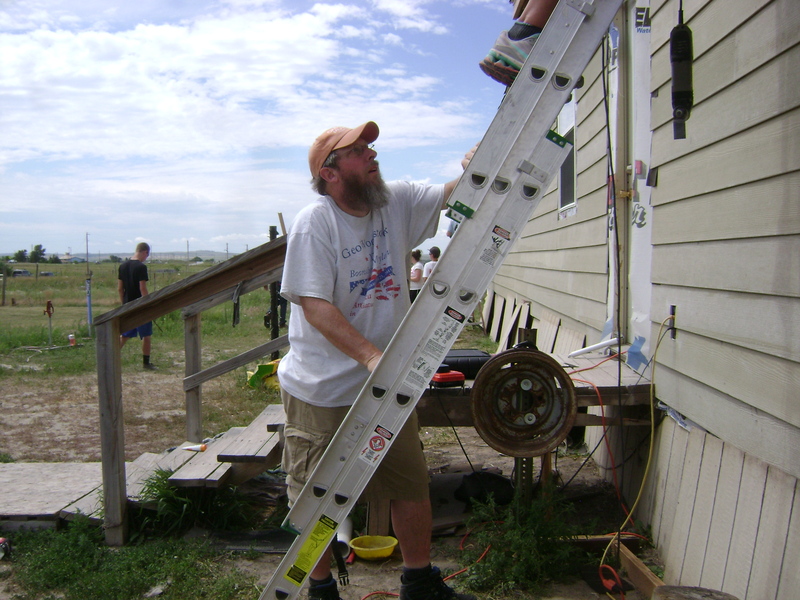 My daughter Stacey and I, along with about 20 other people from Fairfield First Baptist Church, were at Pine Ridge Indian Reservation to serve the community by building and repairing homes, building relationships, and sharing the Gospel of Jesus Christ. We worked through Next Step Ministries. We stayed at a Parks and Recreation facility north of the community of Wounded Knee, SD. Housing consisted of a couple large buildings with rooms holding about 8 guys or gals, sleeping on air mattresses or cots. At least we had heat and air conditioning, and the conditions were better than most of the homes on the Rez. For breakfast, we had pancakes and sausages. As usual, we made sack lunches to take with us to our work sites. A couple of the students in my group made lunches to take to Tyson and Tyrell, the boys who live next to the home we were repairing. The morning was kind of chilly, and it sprinkled a little. After coffee at Higher Ground, we headed to Candy’s house, and got to work. We put up more Hardie board, trimmed out windows and doorways, and caulked a lot of cracks. We found that one end of the trailer was going to be difficult to fix, because much of the framing was rotted out. Our Next Step leader, Rob, would need to do the work to replace the framing before we could begin work on the siding. It was hot – in the low 90s – but a strong wind made the heat bearable. Rain threatened all day, but never came. While we worked, a few of us had a conversation about demonic activity on the Rez. Traditional Lakota religion is based around spirit worship. They believe in a Great Spirit or Creator, as well as other spirits. We discussed how, from a Biblical perspective, these spirits are demons. Followers of traditional Lakota religion use various rituals to keep the bad spirits away and placate the good spirits. The Sage plant is burned as incense to ward off evil spirits. 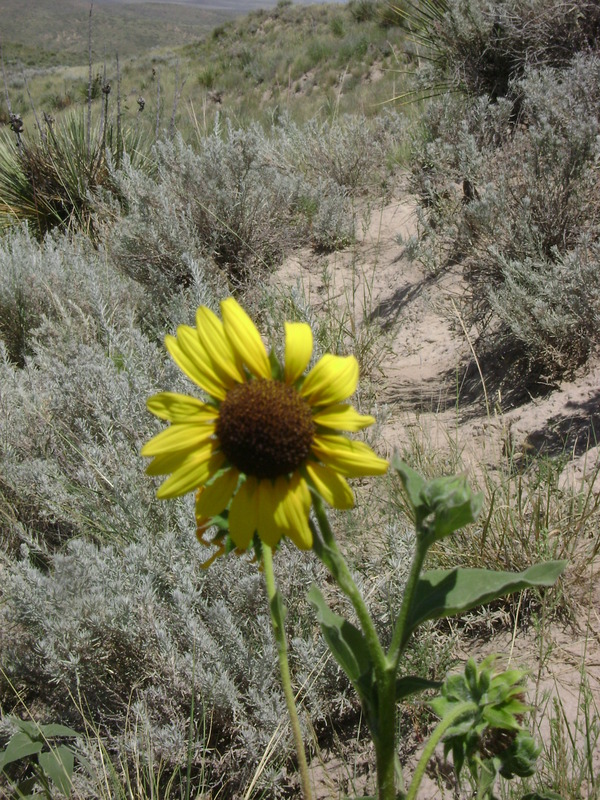 Sage grows all over the place around Pine Ridge – we saw it at Candy’s house, John and Nadine’s house, and along the road between Pine Ridge and Wounded Knee. We talked about how Pine Ridge is a very spiritually dark place – many of the suicide notes mention a dark, shadowy figure who told the person to kill themselves. Candy, the owner of the home we were working on, is a Christian. She plays Christian music in her trailer 24/7, in the belief that it helps keep the evil spirits out. A few minutes after this conversation, the wind blew down one of the ladders, barely missing one of the women from our group. This may be difficult for some people understand, but I’m convinced it wasn’t an accident. I personally had made sure the ladder was set correctly, and although the wind was blowing, it wasn’t gusting strong enough to blow down the ladder. I honestly believe the ladder was pushed by something demonic, in response to the conversation we had just finished. The Bible talks about spiritual warfare happening all around us, that we cannot see, and I felt something that kind of creeped me out just before the ladder fell – a sort of presence, like something was watching me. This is entirely consistent with numerous accounts from many other people about encountering evil spirits on the Rez. Coincidence? I suppose it’s possible, but I doubt it. At lunch time, the teens in our group took the two lunches they had made for Tyson and Tyrell next door to give to them, but they weren’t home; the person who answered the door said they would give the lunches to them when they returned. Later that afternoon, I went over and talked to Wilbert Jr. again. Wilbert was living in a tent in the front yard of his dad Wilbert Sr. while waiting for a teaching job on another reservation to begin later in the month. He had asked if Next Step could do anything to help repair his dad’s trailer before winter. I found out that Next Step has a 2-3 year waiting list for assistance, and that they weren’t even able to take applications at that time. So, Next Step wasn’t going to be able to do any work on the house. However, I told him that I would check to see whether we might be able to leave any left-over materials – Hardie board, nails, caulk, trim, etc. – at the end of the week, so he and his dad could make the repairs themselves. 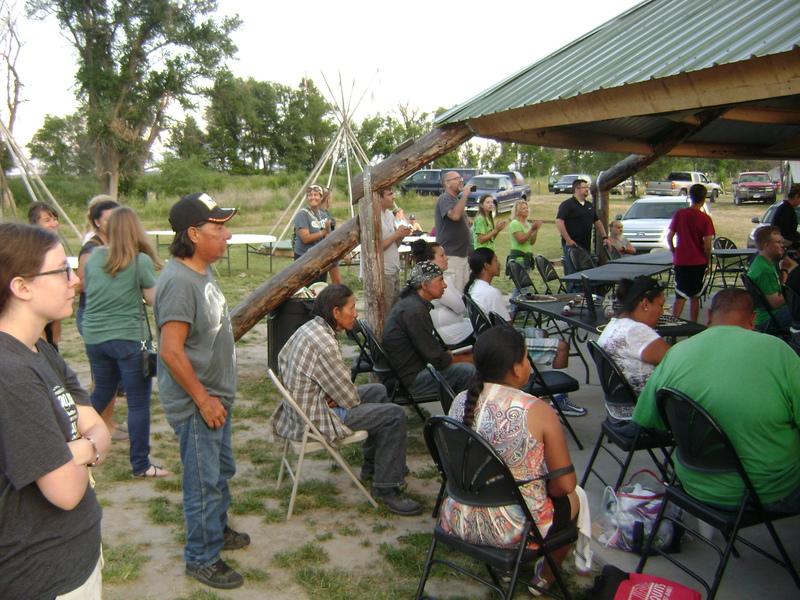 That evening, we went to White Clay, Nebraska, for an evening at Lakota Hope. 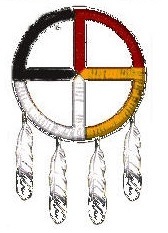 Lakota Hope is “a ministry serving the Lakota Nation – specifically the Risen Warriors (street people) of Whiteclay and Pine Ridge.” White Clay (population 14) is an unincorporated town two miles south of the center of Pine Ridge, just across the Nebraska/South Dakota border. The town consists of several liquor stores and a few homes. Until recently, the sale of alcohol on Pine Ridge Reservation was illegal, so the town of White Clay sprang up primarily to provide alcohol to the Lakota. 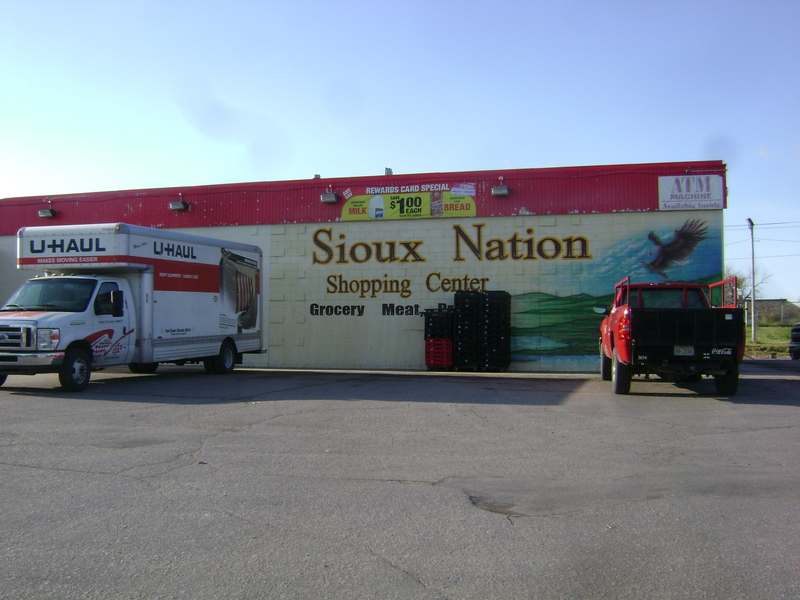 The four liquor stores in White Clay, licensed by the State of Nebraska, sell the equivalent of 4.5 million 12-ounce cans of beer annually (12,500 cans per day), mostly to the Oglalas living on the Pine Ridge. Many of the Lakota who purchase alcohol in White Clay live in the streets, sitting or laying on the sidewalks or alleyways. It’s so common to see drunks on the side of the road, they actually show up in Google Maps Street View. Efforts have been made to shut down the alcohol sales, but the state of Nebraska and Sheridan County officials have taken little action. 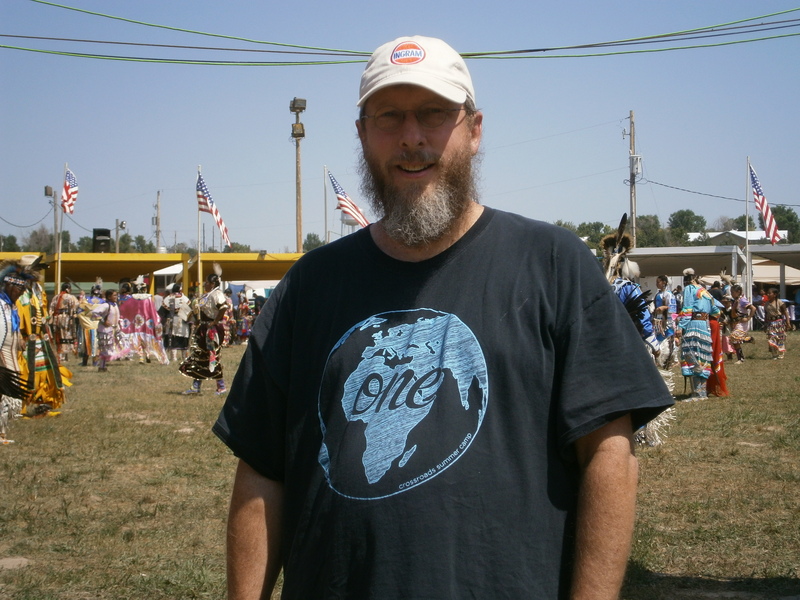 The Lakota Hope Ministry was started and is run by Bruce and Marsha BonFleur, who came to White Clay in August of 1998. They had no formal training, little knowledge of Lakota history, complete ignorance of Lakota culture, and no idea why God had brought them there. 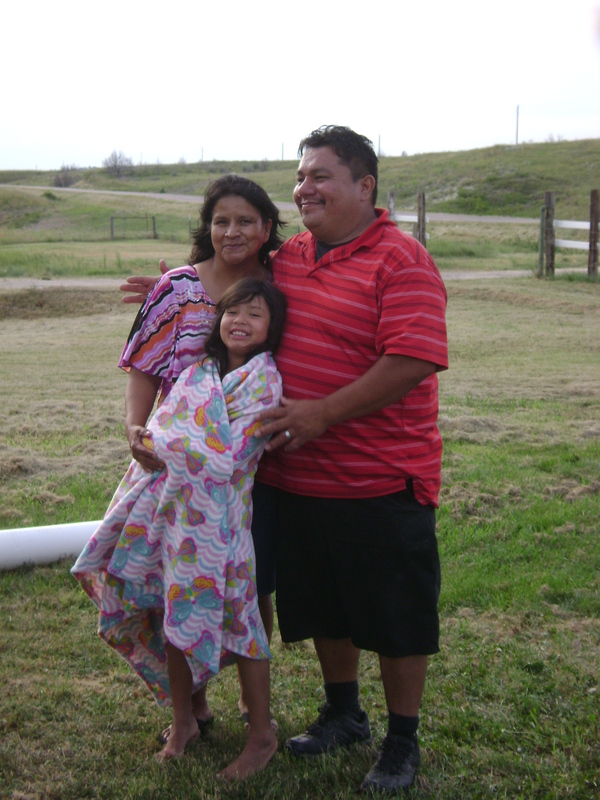 They just had the desire to do what God called them to do – to “live among and serve God’s beloved Oglala Lakota Sioux people on the Pine Ridge Indian Reservation.” Bruce and Marsha built the Lakota Hope Center in White Clay, and have developed relationships with the street people, leading many of them to personal relationships with Jesus Christ. 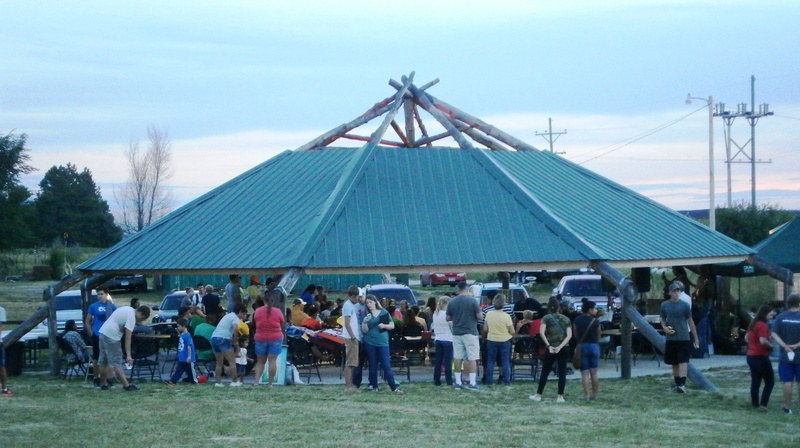 During the summer months, Lakota Hope hosts an event on the grounds where the locals can get a free meal and local artists can sell their work to people visiting the Rez. There is usually a Christian band or singer, a speaker, and a chance for visitors to get to know the street people. On the night we visited, there was a Messianic Jewish band playing a very Israeli style of music, and probably around 30 local artists selling various items. One of my favorite artists was a guy named Kevin Poor Bear. 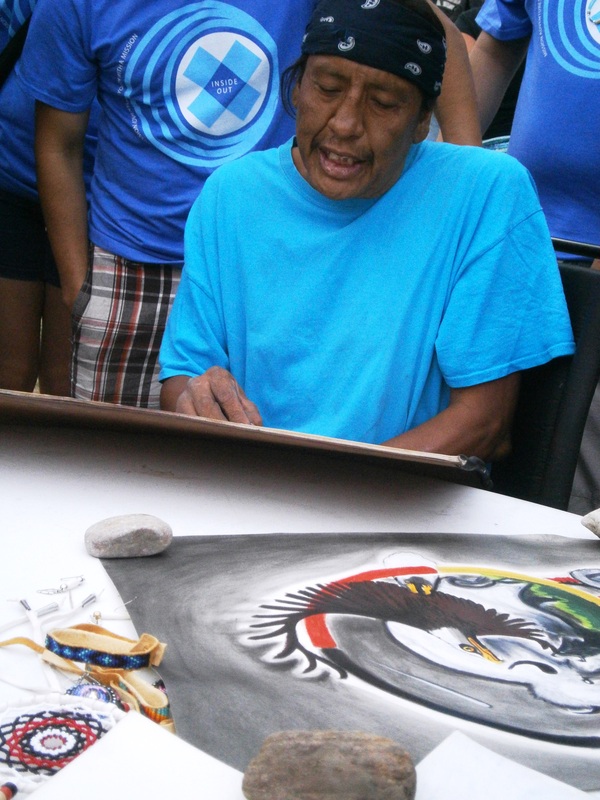 Kevin is a Lakota, double-amputee, former alcoholic Christian with an amazing artistic talent. After his daughter was killed by a drunk driver, Kevin turned his life over to Jesus Christ and gave up drinking, and now uses his talent to bring glory to his Savior. these so-called “Christian” churches weren’t made up of actual born-again followers of Jesus Christ, but rather, cultural Christians – Christians in name only. So, there is a lot of well-justified suspicion and distrust of people calling themselves Christian by the Lakota. The best way to share the Gospel – not just with the Lakota, but with most people – is to start by developing a relationship with them first. Many of the street people of White Clay opened up and shared their entire life stories to those who brought food to them – they were just happy that someone cared enough to listen. And, many from our group had a chance to share the good news of Jesus Christ one-on-one with someone who needed to hear. I’m not aware of anyone getting saved that evening, but many seeds were planted, and many people prayed with that evening. I heard accounts of dark, shadowy figures walking the streets of White Clay after dark. 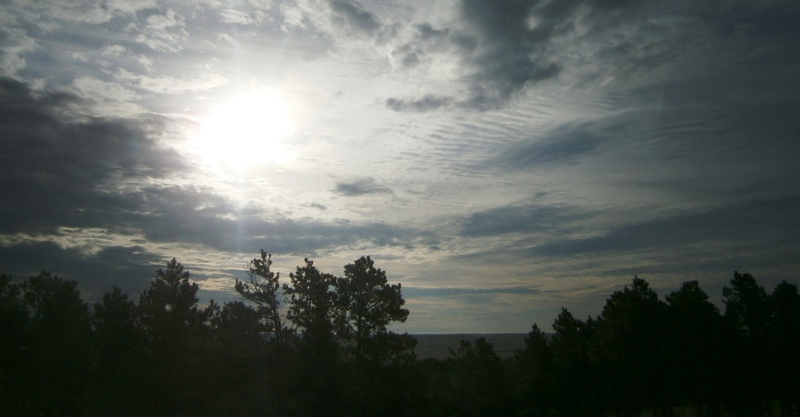 Again, I believe there is real demonic activity on and around the Pine Ridge Reservation, and I heard far too many people describing the same sort of dark, shadowy figure to dismiss it. Many of the street people fear this figure, and Bruce BonFleur says he’s seen it as well. As a follower of Christ, I don’t fear such things, because Christ has defeated the Devil and his minions. However, Christians need to be aware that demonic activity is real, and remain diligent to pray against evil and for those who are oppressed by demons. I’m hoping and praying that we will be able to get some of these things sent out to John and Nadine over the next few months. Later that evening, we stopped at Big Bat’s again for F’reals. Some from our group met a homeless girl named Aimee, who was living in her car with 3 small children. It turned out she was the sister of Cody White Pipe, who many from the group had met last year, and whose story I will tell on another day. There seemed to be a lot of “coincidences” that occurred on this trip; however, I don’t believe they were actually coincidences. God has a way of orchestrating things to bring people and circumstances together for a purpose. Some of the people from our group bought her some groceries and diapers, which were very appreciated. Aimee had recently bought a trailer and some land near Porcupine for $400, but the trailer had been a former meth lab, and was completely uninhabitable. A few of the men from the group agreed to go out the next day to have a look at it, to see if it might be salvageable. Back at the compound, I showered, and went to bed, very tired, yet very optimistic about the rest of the week to come. 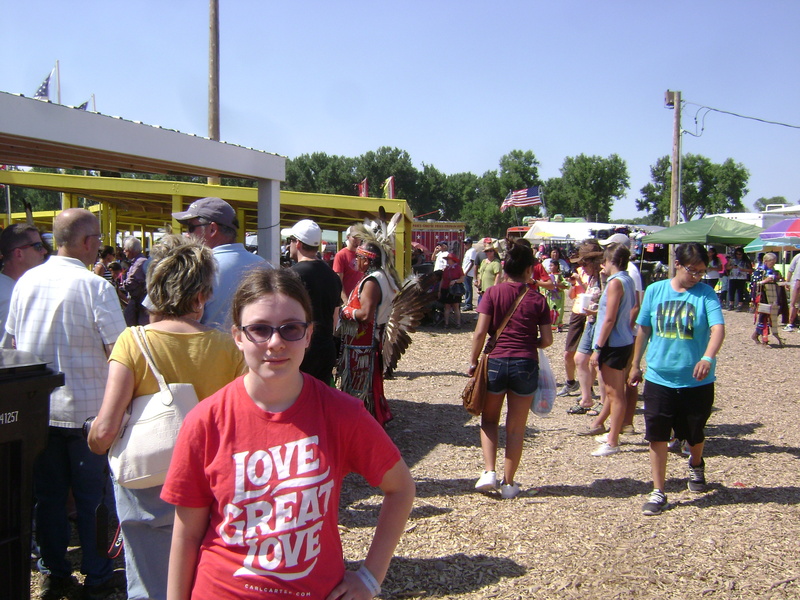 My daughter Stacey and I, along with about 20 other people from our church, went to Pine Ridge for a mission trip. Monday, August 3 was our first full day at Pine Ridge. Our church – Fairfield First Baptist – was joined by a church from the Chicago area and another from South Carolina. We worked with a ministry called NextStep, based in Wisconsin. NextStep works at many sites throughout the US. The three churches were divided up between six work sites. I was assigned with half of the group from Fairfield to put up siding, soffit, and fascia on a trailer just east of the town of Pine Ridge. 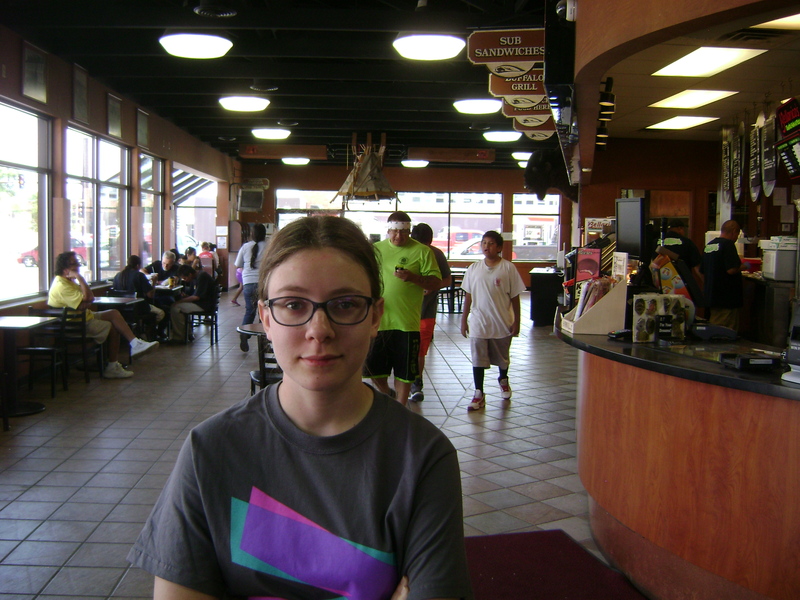 After breakfast and packing a lunch (sandwich, apple, chips, and a granola bar), several of us went into Pine Ridge to a coffee shop called Higher Ground. 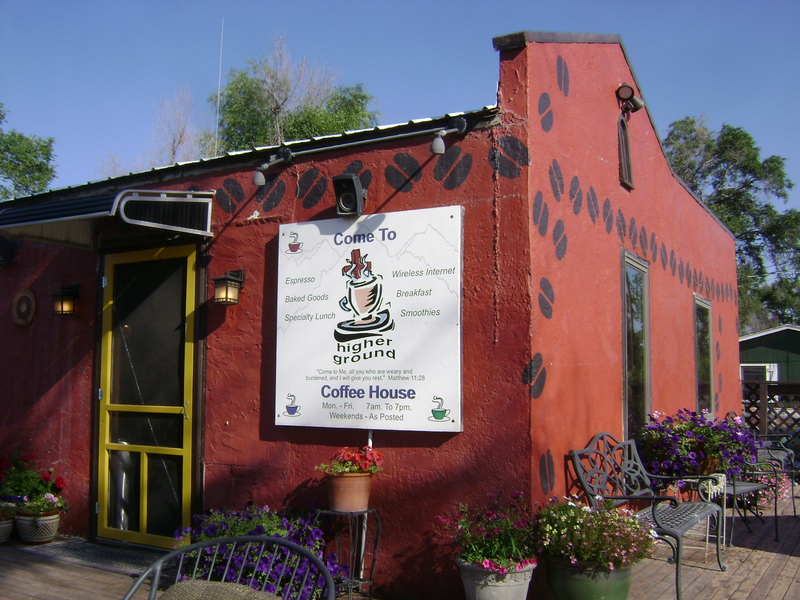 Higher Ground is a Christian-owned coffee shop, first opened in 2005, making it one of the older businesses in town. The coffee and smoothies are fantastic, and the owners are extremely friendly. What impressed me is that they are very open and unashamed about their Christian faith in a place where Christianity is often looked down on. As much as I’m sure that some Christians go there because it is Christian-owned, I also suspect that many traditional Lakota avoid the place because they are open about their beliefs. At the work site, the morning was cool and the sky was clear. Getting started was a bit slow; it took some time to size up exactly what needed to be done, and how to allocate the equipment and workers we had available. Some of the adults were very experienced with home construction projects; most of the teenagers had little or no experience. Most of us were someplace in between. I worked with several other people cutting and installing Hardie Board siding. I was unfamiliar with Hardie Board. It’s siding made of a mixture of concrete, sand, and wood fiber. It’s extremely durable, and not very difficult to install. Others in our group caulked seams and installed trim. I spent quite a bit of time setting and holding ladders for others – the ground was extremely uneven, and we had to make sure the ladders were set up safely. Candy (the home owner) and her husband were not home during the time we worked. They are extremely fortunate in that they both have jobs. With unemployment running around 80-90% in Shannon County, the fact that both have full-time jobs is unusual. I did get a chance to speak briefly with Candy, when she stopped by the house briefly. She is a sixth-generation descendent of Chief Red Cloud, one of the primary Lakota chiefs of the late 19th century. 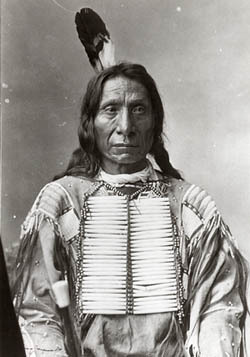 Red Cloud was a renowned warrior and highly respected leader who worked diligently for the Lakota as they transitioned from life on the open plains to the reservation system. After lunch, we noticed a couple of boys at the trailer next to our work site. One of the teenagers in our group got out a soccer ball, and invited the boys over to play. 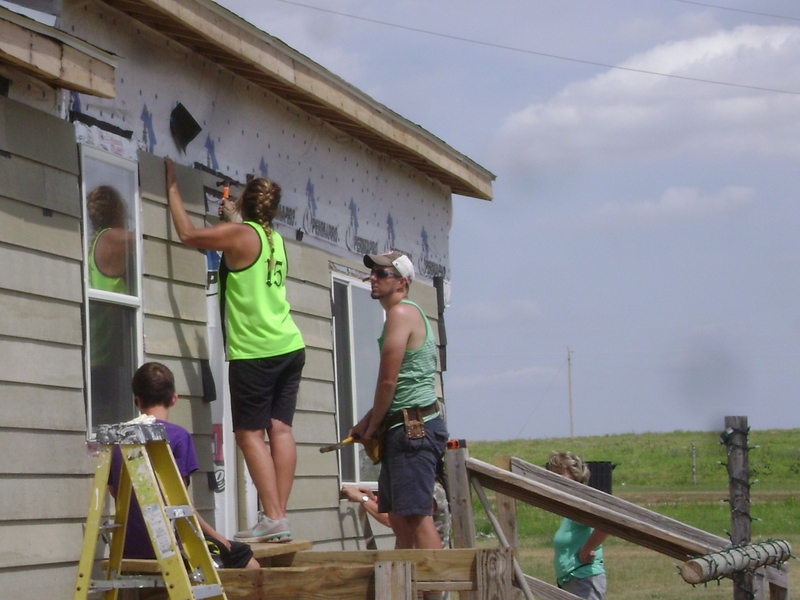 On mission trips like this, the work done on home repair is important, but building relationships with people in the community is even more important. By building relationships, we get to do more than just fix a home. We get an opportunity to know the people we serve, and an opportunity to tell people about the Gospel. Houses are temporary; relationships can be eternal. The two boys, Tyson and Tyrell, played with several of the teens for a little while, and said they’d be back tomorrow. I also noticed a tent set up in the front yard of the double-wide trailer on the opposite side of Candy’s yard from the boys. A man and woman seemed to be living in the tent. I went over to the fence and waved to the man, and he came over to talk. Wilbert and his wife were living in the tent in Wilbert’s father’s yard (also Wilbert), because they had no place else to stay. Wilbert is a Lakota teacher with a master’s degree in education. He has a teaching job lined up for the fall on another reservation, but no income in the meantime. The elder Wilbert’s home suffered serious damage on one end during a recent horrific hail storm. Apparently, large hail was blown nearly horizontally into one end of his trailer, virtually destroying the vinyl siding. There were more baseball-sized holes through the siding than I could even begin to count. Wilbert Jr. asked if there was anything we could do to help his dad get the home repaired before winter. I told him I didn’t know, but that I’d ask NextStep if we could do anything. Wilbert Jr. told me that he is a follower of Jesus Christ, and that there are very few real believers on the Rez. Many Lakota say they believe in Jesus, but in actuality, they simply add elements of Christianity to their traditional beliefs. True followers of Jesus are rare on the Rez, and are often persecuted by those who hold to the traditional ways. After we finished work for the day, our church group went to John and Nadine Bissonette’s home for dinner. Several people from our church have known John and Nadine for a few years, and have built close friendships with them. John and Nadine are Christians, and are fortunate in that they own a house, not a trailer. They have been working to convert their basement into a shelter for battered women and children. NextStep had crews that laid down flooring in the Bissonette’s basement earlier in the summer, and a couple of women from our church had come out to Pine Ridge a few days ahead of the rest of the group to finish the work. John works as a chef at the casino on the Rez. Most people think that since there’s a casino, the tribe must be rolling in money. In reality, the casino barely breaks even, because Pine Ridge is out in the middle of nowhere. Nadine was supposed to have started a job at the Bureau of Indian Affairs, but hadn’t yet because of a bureaucratic snafu. We had Indian tacos for dinner – beans, meat, and toppings on Indian fry bread. They were delicious! On the way back to the compound where we stayed, we stopped at Big Bat’s for ice cream. Big Bat’s is a gas station, convenience store, and café at the main intersection in Pine Ridge. It’s sort of the social hub of the town – if you’re going to meet up with someone in Pine Ridge, you usually meet them at Big Bat’s. At Big Bat’s, we discovered the F’real machine. F’reals are vending machine milkshakes and smoothies that are absolutely delicious! I had the blueberry raspberry pomegranate smoothie. Back at the Recreation Department compound, I tried to call my wife, but had no service. Someone else had one bar, so they had a message relayed to my wife that we were doing fine. After a shower, I got on my cot, turned on the fan, and crashed. 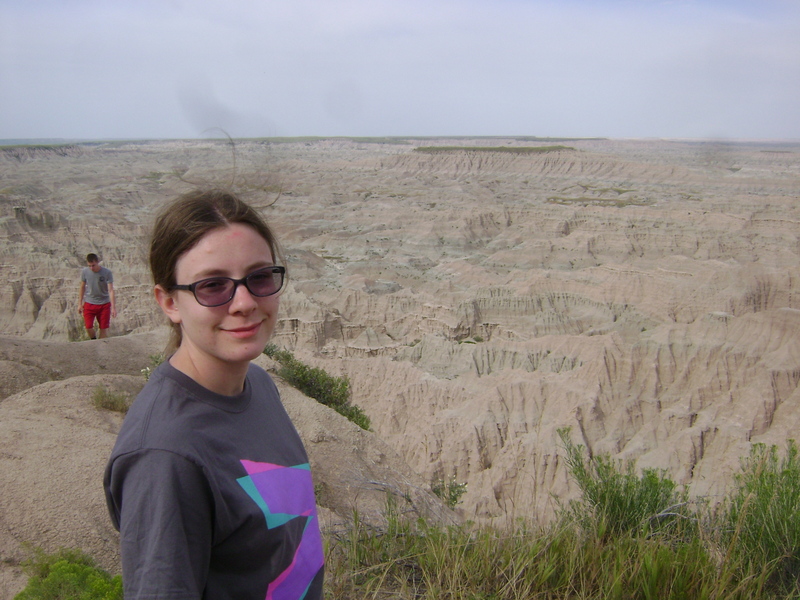 My daughter Stacey and I were blessed by going on a mission trip to Pine Ridge Reservation in South Dakota with about 20 other people from our church during the first week of August. This is the second in a series of blogs about the trip. Most of the other people going on the trip left Saturday morning from the church. Several flew out to Rapid City, South Dakota to do some sightseeing before our week officially began. 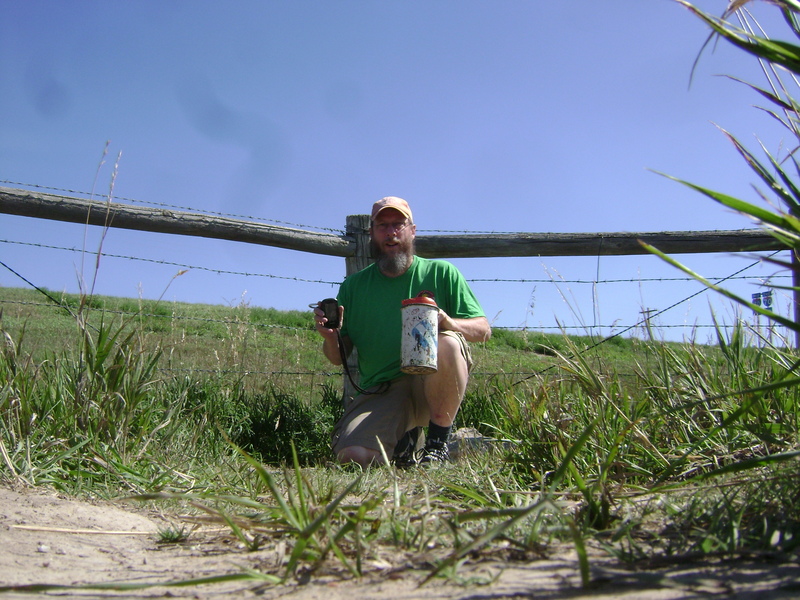 I chose to knock out a “bucket list” item by driving to Mingo, Kansas to find the world’s oldest active geocache. I headed out of my driveway at 7:22 AM on Friday, July 31. The song “We Believe” by the Newsboys was playing on KLOVE. Appropriate, I thought. After grabbing a quick cache in town, I headed west on I-74. After grabbing a quick cache in Indianapolis, I headed west on I-70, grabbing two more caches in Illinois and three in Missouri before heading to my first target cache – GC37, Missouri’s First – Watts Mill. 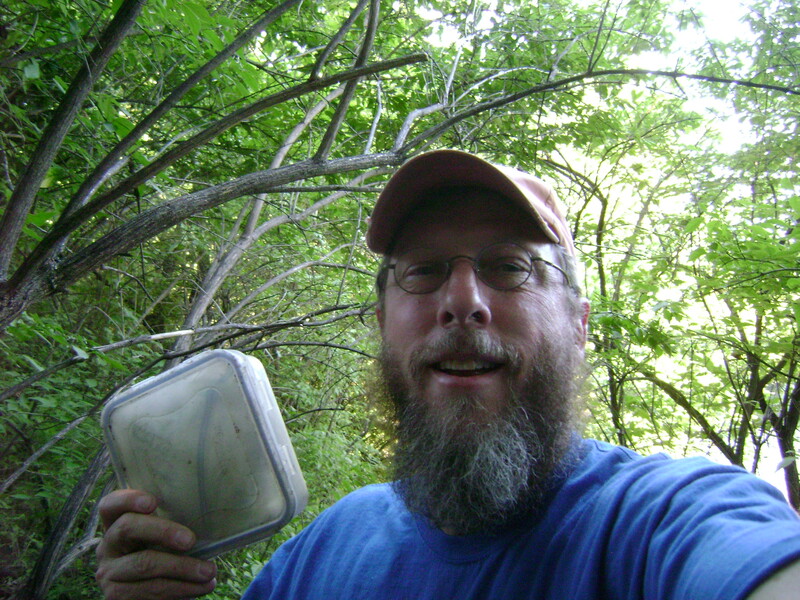 This cache is located on the south side of Kansas City along a walking/biking path, and is the oldest cache in Missouri, hidden on 6/20/2000. It was a quick find after a short walk. I was sort of surprised it had lasted as long as it has, since it’s just off the trail in an area where teenagers obviously like sneak off to drink beer. I again headed west on I-70, grabbed a couple more caches in Kansas before stopping for the night at the Econo Lodge® in Salina, Kansas. Not the best motel I’ve ever stayed at, but not the worst, either. You get what you pay for. I covered 836 miles in 16 hours, 14 minutes, and found 10 geocaches. Long day! Saturday morning I grabbed breakfast in the motel lobby before heading west on I-70 again. I stopped for a total of 4 caches before getting to GC30, Mingo, around 11:03 AM. Mingo is the world’s oldest active geocache. It’s believed to have been the seventh geocache ever created; the six older caches are all gone, making Mingo the oldest remaining cache. There’s nothing special about the location, just a hole in some concrete by the side of the road, just off I-70 in western Kansas. 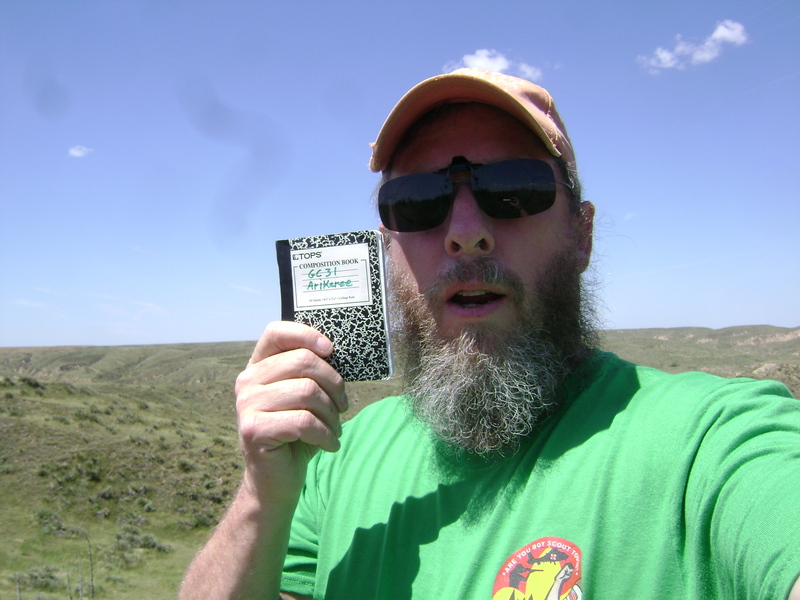 Yet, for those of us who are geocaching junkies, it’s the holy grail of geocaching. It’s the oldest. I’ll never find another one older. As of the time of this writing, it has been found 4,305 times, and has a very well-worn path from the side of the road to the corner of the fence line where the cache is hidden. I signed the log, swapped some travel bugs, took a small plastic lion and left some mardi gras beads from the Midwest Geobash. As I was re-hiding the cache, another geocacher arrived. He had traveled from Colorado, and was headed east. sunflowers. The sunflowers reminded me of a local geocacher named Michelle who passed away about a year ago. Sunflowers were her favorite. I signed the log and didn’t see anything I wanted to trade. I did the nearby Earthcache before heading north on the dirt road into Nebraska. The rest of the day was spent meandering through Nebraska, stopping occasionally for caches, before meeting up in O’Neill, Nebraska, with Stacey and many of the other people from our church going to Pine Ridge. After spending the night at the Holiday Inn Express, the group headed west on US-20, then cut north to US-18, and headed into Pine Ridge. No geocaches. 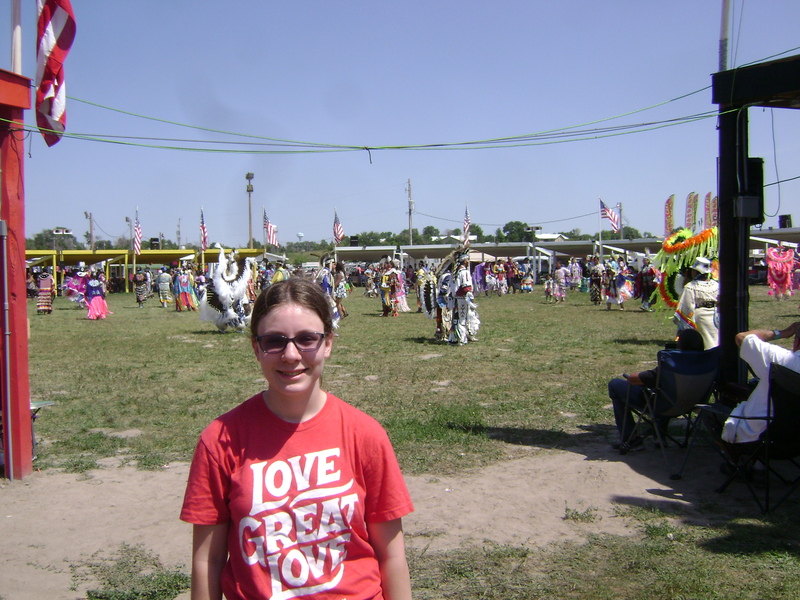 After lunch at the Pine Ridge Subway, we met up with others from our group, and went to the annual Pine Ridge Pow Wow. 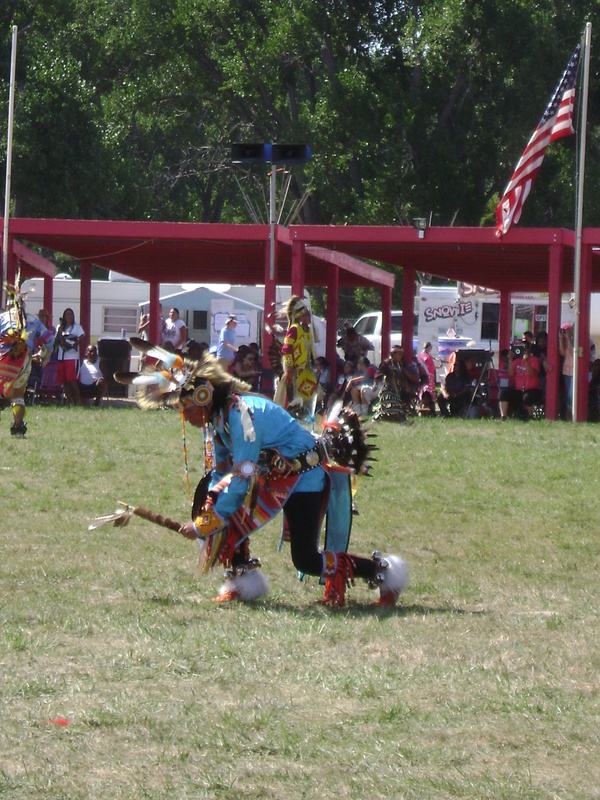 The Pow Wow is a sort of mixture of a county fair and a native dance competition. The Pow Wow grounds is circular in shape, with a small arena in the center, covered seating in a circle around the arena, and a circle of vendors on a midway around the seating circle. explained to me. Around the outside of the seating area was a sort of circular midway with vendors selling food (both traditional and modern), hand-made jewelry, T-shirts, and assorted non-native souvenirs and carnival knick-knacks. There were also a couple of information booths for various Lakota organizations and causes. I spent some time talking to the people in the information booth promoting the restoration of the Black Hills to the Lakota people. According to the treaties from the late 1800s, the Black Hills belong to the Lakota, but when gold was discovered in 1874, the U.S. government stole the Black Hills from the Lakota. The Lakota want the Black Hills returned, and I agree with them. After the Pow Wow, the group went to the compound north of Wounded Knee where we were to spend the week, and settled in. We met the staff from NextStep Ministries who would be working with us for the week, as well as one of the two other churches that were working with us at Pine Ridge for the week (the third church didn’t arrive until very early the next morning), had a worship service, and then went to bed. At this point, I wasn’t sure what to expect for the week. I knew we’d be working on rebuilding some people’s houses/trailers, but beyond that, I had no idea what God had in store for us. I felt it was a good beginning.